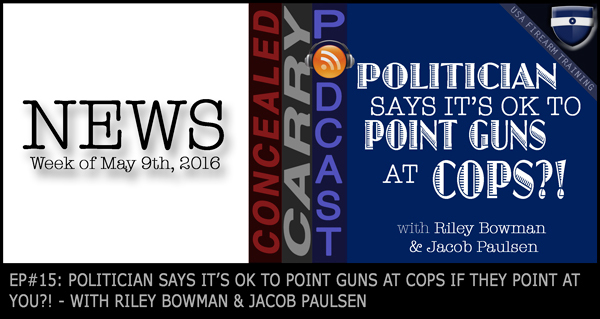 Episode 15: Politician Says It’s Ok to Point Guns at Cops?! 15 Responses to Episode 15: Politician Says It’s Ok to Point Guns at Cops?! What a stupid remark for anyone to make. Anyone who aims a gun at a police officer WILL GET SHOT. That is the name of the game. Liberalism is an incurable mental disease! I sure hope everyone Emails this stupid person like I did. If a Cop is aiming at you-put your hands in the air-period. This politician definitely dont need a gun,And if hes that dumb, He doesnt need to be a politician!! The good guys know that cops are for your protection. RESPECT THE LAW!!! I agree Mary you are 100% correct. Never pointed a gun at cops. Who was the politician that said that? Listen to the podcast episode to find out! The answer may surprise you! Let them point their gun at a cop. They will be shot and that will take one more idiot out of the gene pool. This is a totally irresponsible comment to make. The cops are the good guys. Most fatalities are the result of not following the police instructions, and pointing a gun at them will get you shot. Who is this politician pandering to? Point 2. Maybe he needs to have a gun pointed at him, so he knows how it feels and what’s the police officer feels like when someone points a gun at him. Point 3. Again never point a gun at a COP! Why not? The law says you have a LEGAL right to protect yourself. It doesn’t say unless it’s a cop. If you feel threatened, you have a legal right to use reasonable force up to deadly force to protect yourself, your family or another person. Police are subject to the same laws citizens are. How many officers this year alone are facing murder charges? Don’t get me wrong, I will back an officer any day, any time, any place if they need it. They should be respected. If an officer makes a reasonable request in the course of his or her duties, you should follow it. Treat an officer with respect and 99.9% of them will return that respect, regardless of what you did.